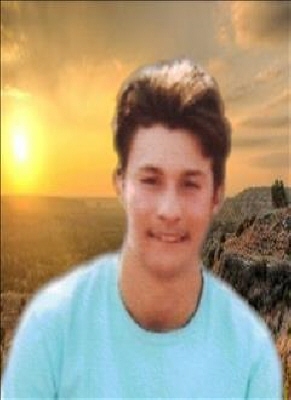 Anthony "Shark Bait" David Montoya, 18, longtime resident of Hollis, Oklahoma passed away October 1, 2018 in Admiralty Island, Alaska. Anthony was born on October 8, 1999 and was a graduate of the Class of 2018 from Hollis High School. During his school years, Anthony enjoyed playing football and baseball, running track, and spending time with his family and friends. He worked at the Sale Barn in Hollis and after high school Anthony worked for the Timberline Drilling, INC in Alaska. Anthony enjoyed attending youth activities at the First Baptist Church in Hollis. Preceded in death by his mother Brandy Kitchen; great grandfather, Donald Wefer; great grandmother, Jewel Kitchen; great uncle, Ronnie Kitchen; and a cousin, Michelle Kitchen. Anthony is survived by his brother, Angel Montoya; sisters, Alexa Montoya, Arissica Fuentes; Erica Michelle Fuentes, Jessica Ashley Fuentes all of Hollis; his great grandmother, Beverly Wefer; grandfather, Faron Kitchen; grandmother, Mindy Kitchen; grandmother, Donita Solis; step-father, Willie Shaw; uncle, Jeremy Kitchen; uncle Alex Solis and wife Sara and their children, Chelsey and Joslyn; as well as a host of cousins, Clayton, Jaycee, Brooklyn, Victoria, Morgan, Juan, Joel, Layla, Heather, Christine, Zachery, Blake, Collin, Michael, Landon, Kaylor, and Donald Lee; as well as numerous other family members, and many friends. The family of Anthony "Shark Bait" Montoya will receive friends at visitation from 6:00 pm until 8:00 pm on Saturday evening, October 13, 2018 at the Harmon County Funeral Home in Hollis, Oklahoma. Celebration of Life services will be at 2:00 pm, on Sunday, October 14, 2018 at the Hollis High School Auditorium in Hollis, Oklahoma. Arrangements are under the direction of Harmon County Funeral Home of Hollis, Oklahoma. To send flowers or a remembrance gift to the family of Anthony David Montoya, please visit our Tribute Store. "Email Address" would like to share the life celebration of Anthony David Montoya. Click on the "link" to go to share a favorite memory or leave a condolence message for the family.